Does the Auto Industry Still Need Welders? While the auto industry uses more welding robots than ever before, skilled welders are still needed to handle specialized welding jobs and supervise the welding robots. What is more, working as a welder in the manufacturing industry can be quite rewarding, especially for those who have invested in their careers through welding training. If you’re considering entering the auto industry as a certified welder, the answer is yes, the auto industry still needs actual human welders. However, there are some specific skills required to land a job as a welder, solderer, or welding supervisor for a car manufacturing company. Laser welding and MIG welding are two techniques that are especially in demand in the auto industry, as they are used on aluminum, a metal that is increasingly being utilized in the manufacture of all vehicles. Laser welding is particularly important to learn because it is used for sheet metal processing and can enable one to land a job manufacturing not only standard cars but also the energy efficient ones that will come to dominate the market in the future. While the average welder in the manufacturing industry earns a median annual wage of $44,000 per year, those who can work with sheet metal earn a median wage of $67,500 per year. Welding Technician: Welding technicians supervise welding robots, overseeing as many as 50 robots at a time. While the job growth percentage in the field of robotic welding is unknown, car manufacturing companies are finding it difficult to locate skilled workers for this position. The median annual salary for a welding technician is presently $55,000. Those who want to obtain work supervising welding robots need not only welding education but also additional training in working with robotic welding machines. The requirements for finding work vary from company to company; however, the more specialized welding training one has, the easier it is to find a high-paying job. Welding Maintenance Technician: A welding maintenance technician is tasked with maintaining and troubleshooting old robotic welders and installing new ones. The Bureau of Labor Statistics 1 sets job growth in the industrial maintenance field at 17%, much faster than average, and the median annual wage for a maintenance technician is currently $45,840. Formal training at a welding school, followed by on-the-job training, is often necessary to become a welding maintenance technician. Car manufacturing is certainly one industry available to those with welding training. 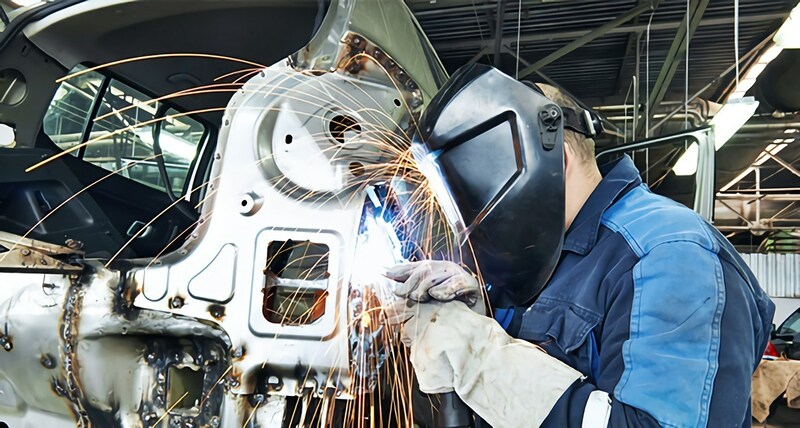 Welders with the skills necessary to work in the auto industry are in demand and can potentially earn higher incomes than those in other fields; however, it is important to understand exactly what type of welding skills are required to work for a car manufacturing company. For example, laser welding and MIG welding are prominent skills to have. This knowledge can then steer you toward the right training upon graduation from a welding college and, ultimately, a profitable career. Conversely, if you are currently undergoing welding training, the auto industry may be one you consider pursuing after graduation. High quality technical training is available at Tulsa Welding School. The school has three locations—Tulsa, OK, Jacksonville, FL, and Houston, TX—where you can obtain hands-on training from industry professionals. TWS also offers financial aid, student housing, and career services, as well as assistance to those in the armed forces. Don’t hesitate to contact us today to learn about the opportunities.